Best Weight Loss Plan, How Does a Pedometer Work? The best weight loss plan will have you obsessing about how much movement you are getting, not about food... here's how. Researchers are in agreement that the best weight loss plan in addition to eating a healthy diet is to elevate your metabolism by doing some type of regular movement every day. Sounds simple doesn't it? The truth is as we all know in the busy-ness of our lives, going to the gym, lifting weights, taking an aerobics class...these activities sound wonderful but we don't do them. At least we don't do them forever. We can be desperate to lose weight and plan to keep taking those aerobic classes but how many of us keep it up? This is the cheapest way to ensure a natural high that you can do ($20) and you can order by clicking on the Amazon link below. The key to permanent fat loss is living as though you are already at your ideal goal weight and that means putting more activity into what you are already doing. The best weight loss plan means adopting the activity as a permanent part of your life. How to do that? Use a pedometer and obsess about how many steps you are getting each day! The most effective, the most efficient and the least complicated way to become more active is to wear a pedometer every day. A pedometer is an activity monitor you can attach to the waist of your clothes that tracks every step you take during the day. What a reality check! I thought I was an active person but I found the first day I wore one without doing any extra exercise that I was only getting 3,500 steps. This is considered sedentary and it is what the average person gets who doesn't get enough physical activity. Then I added my 20 minute power walk which I gradually increased to an hour and found that I could get 10,000 steps. This is what it takes to live at your goal weight and lose that extra fat forever. I love wearing a pedometer. You are "competing" with yourself to get more steps and it becomes a game. It is extremely motivating to wear a "clicker" and I find myself checking it often, determined to meet my daily activity goals. I was thrilled when I got to the point of getting in 10,000 steps every single day! What happens at that point is your metabolism gets notched up and you find you are obsessing about walking (swimming, biking, running) enough to get your 10,000 steps instead of food. Everything changes when your metabolism increases to this extent. No longer do you need to be so fanatic about your eating. You have reset your metabolic "clock" and you are addicted to the movement. A pedometer is run by a battery which comes with it (plus one spare) and has a life of 2 - 4 years. It is easily attached to the waistband of your pants. To get the most accurate readings you must wear it snugly in an upright position, parallel to the ground. You will first get a baseline for yourself and then you can gradually add steps. You can do this in all sorts of ways like pacing while you're talking on the phone, using stairs at every opportunity, walking back and forth while waiting and adding more fun, easy physical activities to your schedule. However, you will have to do some serious aerobic movement to get to 10,000 steps. Studies have shown that if you record and graph your behavior you can change it. 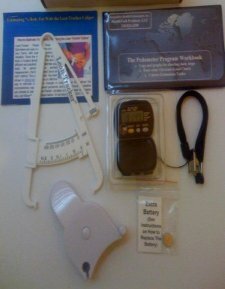 The clicker kit below has a helpful checkbook that gives you extensive pedometer instructions, click equivalent charts for all sorts of physical activities and many more helpful hints and ideas to support your best weight loss plan. The best rated pedometer we could find is the Yamax. They say that the Yamax is the gold standard for pedometers. Yamax has an ongoing program of research and high standards of durability, precision and accuracy. If you would like a clicker kit as shown at the right, it includes the pedometer, a safety strap, a checkbook to record and track your steps and estimate your calories, calipers, tape measure, and extra battery. It is available from HealthTech Products for $50. Tell Julie you read about it here and you will get 10% off. Call 210-274-6193 CST. If you just want the Yamax pedometer for $20, click on the Amazon link below! For more ideas for increasing your metabolism and burning fat click the links to the articles below. How many calories burned swimming, cycling, running, walking...find out how many calories you use in 30 minutes - in an hour! This specially formulated coffee supports weight loss. Green tea is extraordinarily good for your health and also supports losing fat. This is what happens with continued dieting and what to do about it. Return from Best Weight Loss Plan to Slow Metabolism. Return from Best Weight Loss Plan to Lifetime Fat Loss home page.